During a recent trip to Mexico with some friends I stopped in past the new British Airways business class lounge at Gatwick and thought I would share some thoughts. Since the move from the north terminal British Airways has two new lounges in Gatwick South, the First Lounge and the Business Lounge. Both are quite small in comparison with the galleries lounges over at Heathrow which have a spa and showers within the lounges (the Concord lounge at Heathrow has got to be one of the best in the world). The Business class lounge does get quite busy around mid-day but if you head up to the mezzanine level it feels much less hectic. With a good selection of breakfast rolls for in the morning and a selection of hot meals for lunch you won't find yourself feeling peckish. If you are looking for a cold drink to go with your lunch or just get yourself in the holiday mood there is a great selection of premium drinks and Champagne on request (just ask one of the staff for a glass). I do think the lounge could do with being a little bigger but saying that I didn't struggle to find a seat. It just felt very busy compared to the galleries lounges in Heathrow, especially around the buffet area. How do you get access to the lounge? 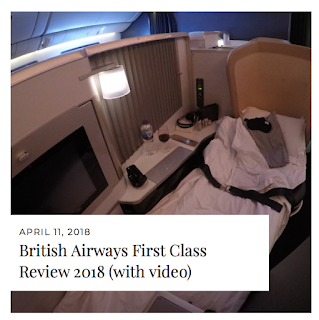 If you want to know how you can become a British Airways Silver member quickly I've written an easy guide in my recent post featuring a great promotion from Qatar airways , check it out here! The deal won't last forever so make sure you catch it before it's too late. You can also use the lounge if your flying Club Europe which if purchased during a BA sale can be highly worth it. Along with lounge access you can use the dedicated business check in desk, priority security and priority boarding. The Club Europe seats are not that exciting (extra leg room with the middle seat turned into a table) but the food and drink is cracking, no crappy take away boxes here its proper plates and cutlery with very attentive cabin crew to ensure you are well fed and watered - I'm talking alcohol here. Heading to Glasgow on your next British Airways flight? 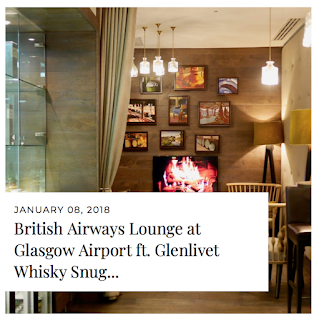 Why not check out my review of the exclusive Glenlivet whisky snug at the BA club lounge in Glasgow. Or are you flying first class from Gatwick? why not check out how we got on travelling in British Airways most premium cabin to St Lucia from London Gatwick.